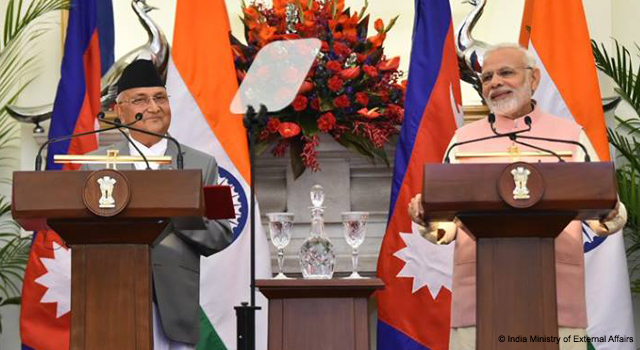 Nepal Prime Minister KP Sharma Oli emphasized the high importance Nepal places upon its relationship with India, and Nepal's desire to further strengthen this bilateral partnership, in a meeting with India Prime Minister Narendra Modi on 7 April 2018. Prime Minister Oli visited India on 6-8 April 2018, upon the invitation of India’s Prime Minister. The two Prime Ministers jointly inaugurated the Integrated Check Post (ICP) at Birgunj, Nepal. The ICP was built with the aim of boosting cross-border trade, and improving the transit of goods and movement of people, to unlock opportunities for growth and development in the region. They also witnessed the ground breaking ceremony of the Motihari-Amlekhgunj cross-border petroleum products pipeline at Motihari, India. Prime Minister Oli and Prime Minister Modi discussed the need to fast-track bilateral projects in Nepal, and re-energize existing bilateral mechanisms for cooperation. They also issued joint statements on new India-Nepal partnership in agriculture, expansion of rail linkages from Raxaul in India to Kathmandu in Nepal, and building new connectivity through inland waterways.